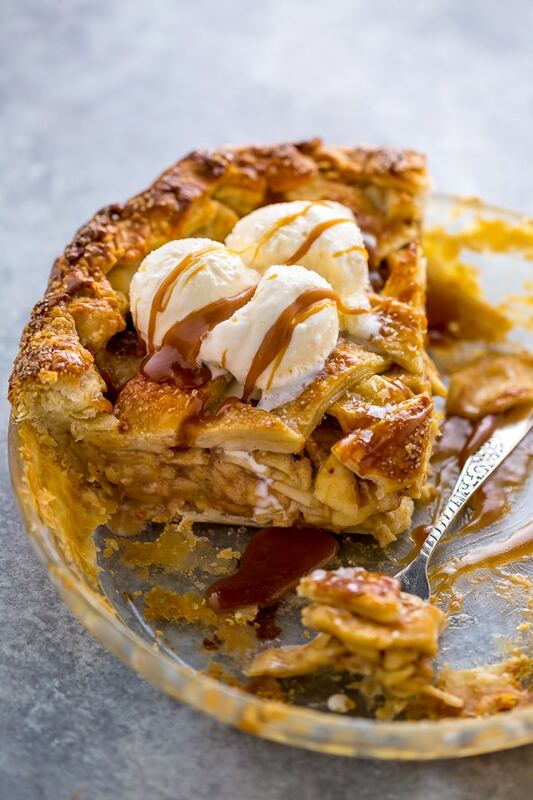 This Salted Caramel Apple Pie is loaded with juicy apple slices and salted caramel sauce! Baked in the flakiest all-butter pie crust, it’s the perfect apple pie for Thanksgiving or Christmas! First of all, let’s talk pie crust! Because it’s such an important part of the pie. I highly suggest using my foolproof all butter pie crust – and reading the entire post if you’re a pie crust newbie. You’ll need a double portion since this is a double crusted pie. This pie crust is easy to roll out, making it a breeze to assemble. I like to do a lattice design and crimp the edges, but you can be creative with your top crust! So now that we’ve covered the crust, let’s move onto the salted caramel sauce. I recommend using my easy salted caramel sauce recipe because it’s what I used, meaning I can say it 100% works in this recipe. However you can definitely use your favorite recipe or even store bought, if need be. 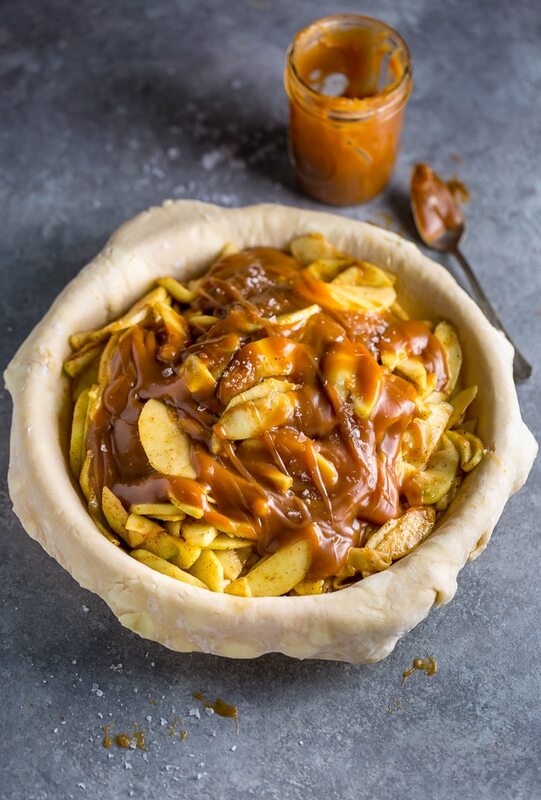 When it comes to choosing your apples, I suggest using granny smith, which are perfectly tart and marry beautifully with the sweet and salty caramel sauce. Don’t skip the apple sweating step! This helps the apples release excess moisture which ensures a less watery pie. No one wants a watery apple pie!!! Because homemade pies are a labor of love – and time consuming!!! – be sure to read this recipe in its entirety and plan ahead time wise. 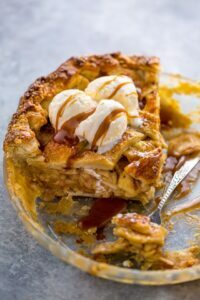 If you try this recipe for Caramel Pie Recipe, let me know! Leave a comment below and don’t forget to snap a pic and tag it #bakerbynature on instagram! Seeing your kitchen creations makes my day. 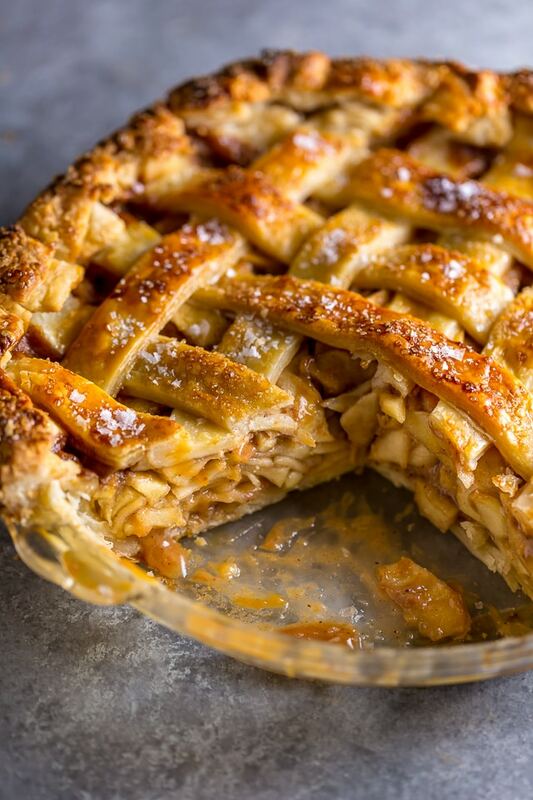 Meet your new favorite apple pie! 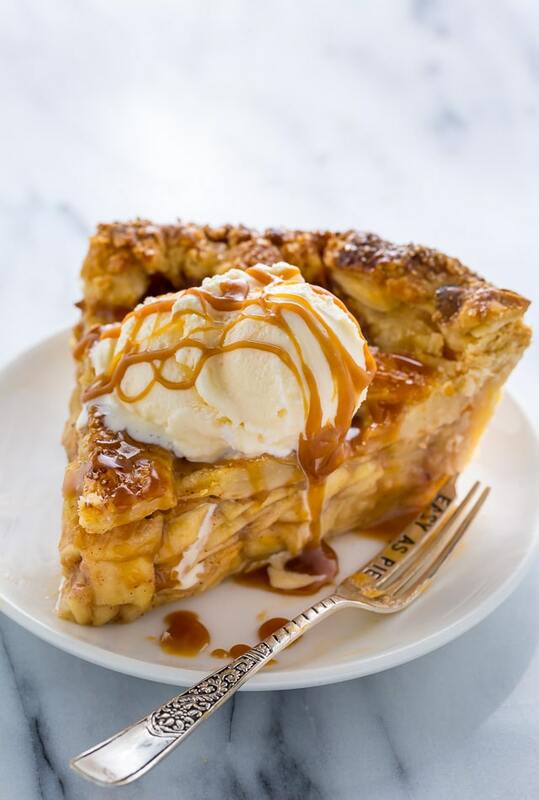 With its thick crust and juicy salted caramel apple filling, you're sure to be hooked after one bite. Preheat oven to 400 degrees (F). Lightly grease a 9" pie plate with non-stick spray OR butter and evenly sprinkle with a little flour; set aside. Roll out one portion of the chilled dough on a lightly floured work surface, rolling it to about a 12-inch round. Gently place the dough into the prepared pie dish and trim the edges so that only 1/2 an inch of pie dough is hanging around the side. Sprinkle the bottom of the pie shell with 1 teaspoon of flour and 1 teaspoon of granulated sugar (this helps soak up excess moisture). 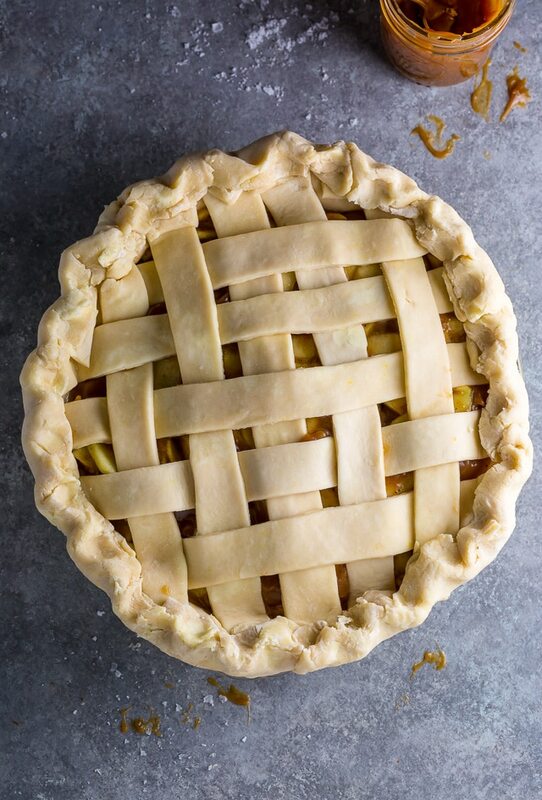 Place pie shell in the fridge while you prepare your lattice topping. Line a large baking sheet with parchment paper and set aside. On a lightly floured work surface, roll out the second disk of chilled dough, rolling it out into a 12-inch round. Slice the dough into 8 even sized strips. The best way to do this is by using a pizza/pastry wheel, but you can also use a ruler and knife. Carefully transfer the strips onto the prepared baking sheet (making sure they don't touch) and place the pan in the fridge while you prepare the apple filling. In a large bowl combine the sliced apples and lemon juice, toss well to coat the apples in the lemon juice. Sprinkle with granulated sugar and set aside for 30 minutes. In a separate large bowl, combine the light brown sugar, cinnamon, allspice, nutmeg, black pepper, salt, and flour. Use a slotted spoon to add the sliced apples into the sugar-spice mixture, leaving excess liquid behind. Gently toss the apples in the sugar-spice mixture until they're evenly coated. Tightly layer the apples into the prepared pie shell. Pour the salted caramel sauce on top of the apples, then sprinkle with a 1/2 teaspoon of flaky sea salt. Place 4 parallel strips of the pie dough on top of the filling, leaving about a 1/2 inch of space in between them. Gently fold back every other strip. Place one strip of pie dough perpendicular to the parallel strips, then unfold the folded strips over the perpendicular strip. Carefully take the parallel strips under the perpendicular strip and fold them black over the perpendicular strip. Now lay down a second perpendicular strip of dough a 1/2 inch next to the first strip; unfold the folded parallel strips over the second strip. Repeat this process until the lattice weave is complete on top of the pie. Trim the edges of the strips of pie dough, so that they're only 1/2 an inch over the sides. Tightly fold the excess pie crust up and onto the rim of the pie dish, then gently crimp the crust using two of your fingers. Chill the pie in the fridge for 15 minutes. In the meantime, beat together the egg and water. Once pie has chilled, brush the pastry with the egg wash. Sprinkle with 1 tablespoon of turbinado sugar (if using) and remaining sea salt. Loosely cover the crust with tinfoil or a pie crust shield. 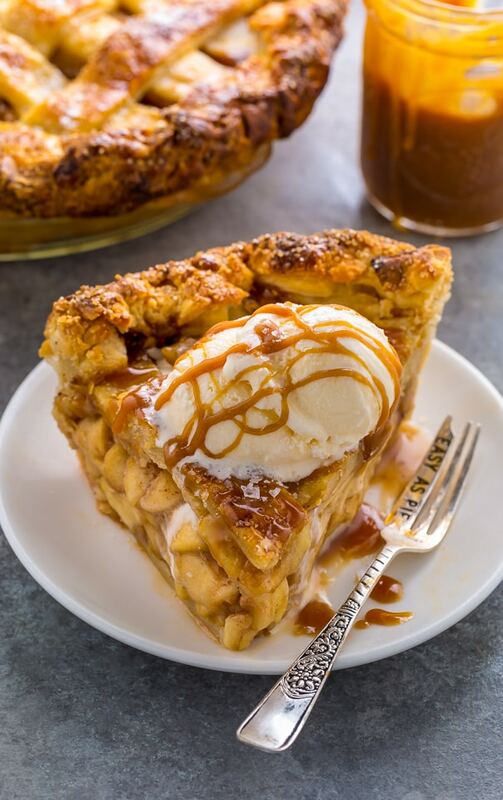 Bake pie on the bottom rack of the preheated oven for 30 minutes, then carefully remove foil or pie crust shield, reduce the heat to 375 degrees, and continue baking for an additional 30 minutes, or until the crust is golden and the filling is aggressively bubbling. Allow pie to cool completely on a wire cooling rack; about 4 hours. Pie will keep, tightly covered in the fridge, for 3 days. I’m going to try my hand at my first fruit pie this weekend and I’m pretty sure this is the recipe I’m going to use. Do you have to use light brown sugar or is dark okay? This looked like an easy recipe to follow, but then I got to the final step.. I’m 10 minutes into the 4 hour waiting time and I fear my patience won’t last. It looks and smells so tasty! If I make this pie and then freeze it before I bake it, what should I bake it at when I get it out of the freezer? i made this pie for Thanksgiving & we liked it, but not rave reviews ~ i have a couple of questions 1 ~ i used Granny Smith apples & they were still pretty crunchy, even after baking the full hour. i sliced them 1/4” thick. should i slice them thinner??? 2 ~ my caramel sauce never thickened, even after cooling. should i have cooked it a few minutes longer till it was thicker? thanks so much. I made this pie for Thanksgiving and it is my all time favorite!! Thank you for the thorough instructions on the pie crust as it rolled out perfectly and couldn’t have been better. The pie did bubble over so it made a little mess in my oven. Maybe I should have used a deep dish pie plate? Or put it on a baking sheet? I am looking through your recipes for Christmas. What is your all time favorite?